We all understand that racing carburetors like to run wide open. Since the Bear baseplate throttle stop uses its own set of secondary butterflies to regulate air/fuel flow, your carburetor operates at full throttle throughout the run. 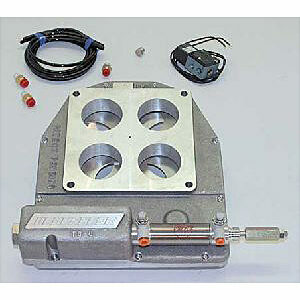 Engines using Dominator style carburetors are typically high horsepower so Dedenbear uses large 2-1/8” throttle bores for maximum horsepower and consistency. The Bear Stop uses a single piece aluminum casting that eliminates any chance of leaks or misalignments, throttle shafts and levers are tig welded to prevent loosening and the shafts, levers and butterflies are made of polished stainless steel to insure corrosion resistance and good looks. There are two actuating methods available to operate the throttle stops. Most stops come with an electric solenoid to open and close the butterflies. It is simple, consistent, reliable and works for the majority of cars. Some high power cars can spin the tires when the throttle stop opens during the run. To prevent this from occuring, Bear Stops are also available with a CO2 actuator that allows you to ”tune” the opening rate for track conditions. 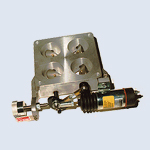 The Bear Stop is typically used either with a throttle stop timer or by running a fixed setting for the entire run. The throttle stop timer allows a racer to turn the throttle stop off and on as the car goes down the track. In either method the throttle stop can be overridden allowing you to ”run a guy down” on the top end by manually pushing an override switch. Adjusting the Bear Stop is simple, An indexed stop bolt lets you easily make precise and repeatable settings. Using a throttle stop controller to activate the stop results in even more accurate E.T. adjustments. Based on the standard baseplate throttle stop, the Double Bear adds a second actuator to allow independent control over the primary and secondary butterflies. This allows for an incredible amount of possibilities. Launch with the secondary closed to control tire spin, close the primary to control E.T., then bring the primary followed by the secondary open progressively to control tire spin coming back off the stop. Choose electric solenoid (quick open & close), or single acting cylinder (adjustable opening rate) for each side stop to fit the specific needs of your throttle stop program. 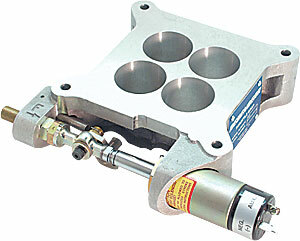 The Dedenbear Baseplate Throttle Stop is meant for the Holly 4500 series carburetors. Baseplate throttle stops are meant for high performance applications, and makes sure your carburetor operates at full throttle throughout the run.